Breast pain, or mastalgia, refers to any feelings of discomfort, tenderness, or sharp pain experienced in one or both breasts. Although the primary cause of breast pain tends to be hormonal fluctuations, breast pain triggers can be broadly divided into two categories, cyclical and non-cyclical. Whereas hormonal fluctuations are largely responsible for any cyclical pains, non-cyclical breast pain is generally triggered by environmental, lifestyle or medical factors. 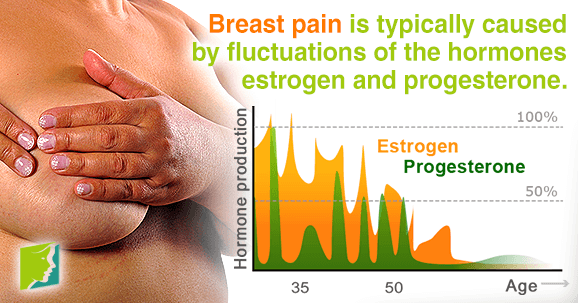 Hormone triggered cyclical pain is felt when estrogen and progesterone fluctuations cause the breast tissue to become inflamed. Cyclical breast pain is responsible for most instances of mammary pain and is commonly experienced periodically in line with hormonal fluctuations. A hormone is a natural compound produced by organs like the thyroid gland or the ovary. These "messengers" have a direct effect on many of the bodies functions including the reproductive cycle and the development of breasts. Consequently, women typically experience cyclical breast pain during times when estrogen and progesterone hormones are in flux, like during menstruation, pregnancy, and menopause. In addition to not typically being related to hormones, most cases of non-cyclical breast pain have no identifiable cause. Because non-cyclical breast pain is not linked to hormones, most cases are experienced by postmenopausal women, as their hormones tend to have ceased fluctuating. Some prescription medications, like antidepressants or oral contraceptives, can also cause breast pain as a side effect. Costochondritis - the inflammation of the ribs' junctions to the breastbone or sternum - is another non-cyclical breast pain trigger. Costochondritis typically affects older women, and can be a result of years of bad posture. Breast pain can be triggered by poor diet, lack of exercise, and high stress. Women who maintain a poor diet that is high in salty foods and saturated fats are more likely to experience breast pain than those with healthy diets. Maintaining a healthy diet that includes, fruits and vegetables, protein, complex carbohydrates, and good fats is vital. Combine diet changes with regular exercise for optimum results. Stress is one of the leading triggers of menopausal symptoms because it weakens the body leaving it more susceptible to pain and illness. Stress can be reduced by reading, drawing, listening to relaxing music, mediating, and practicing yoga. Breast pain is a troublesome symptom of menopause that can sometimes be debilitating. It is important to remember though that nearly all women experience breast pain at some point but in most cases, will be treated. There are other causes of breast pain, like poor diet and stress.Taking time to exercise and eat well can significantly reduce the risk of breast pain in women.